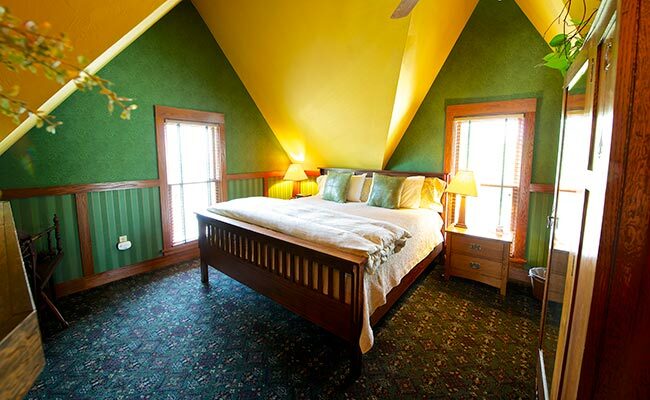 Make ReservationIntermingling styles inspired by the arts and crafts movement are generously reflected in this spacious king bed and breakfast room. The fireplace quickly catches your eye: being two-sided, it separates the bedroom from the sitting area and offers warmth to both. 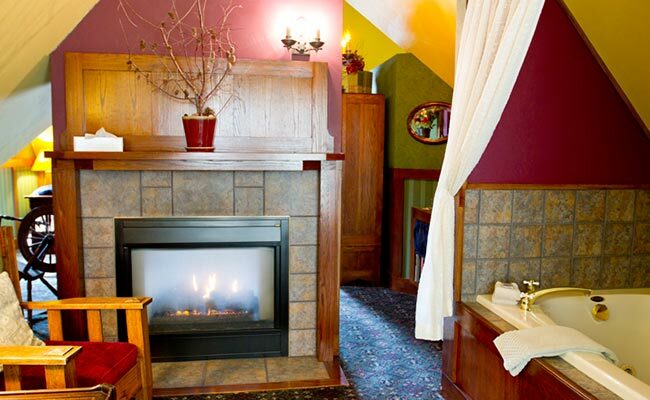 The perfect way to relax after a long hike through one of Door County's 5 state parks or an afternoon of shopping. 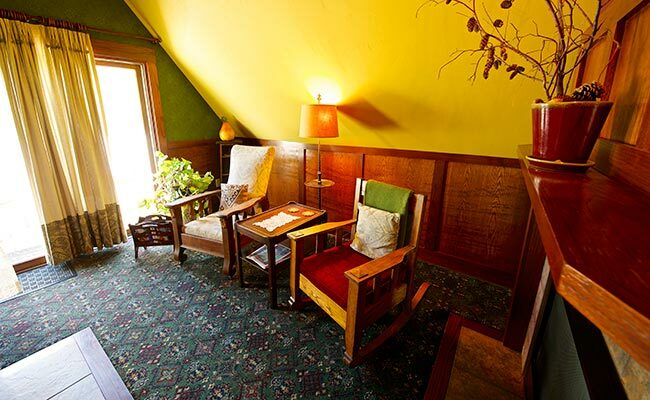 Stickley and Mission styles blend comfortably in the sitting area of the Arts & Crafts Room. 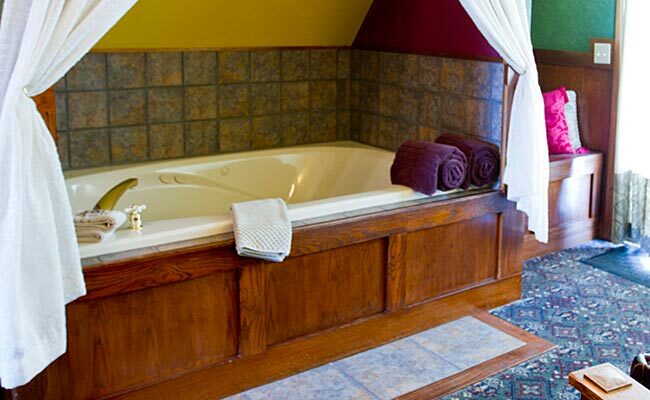 A hot tub greets you, nestled into the room that is filled with rich tones of green, gold and burgundy. The fireplace facing the king bed displays a gently arching mirror that reflects floral arrangements and a Maxfield Parish print. The warmth of the wine-colored walls is enhanced by the candle-style light fixtures. The window dressing features wooden Venetian blinds. 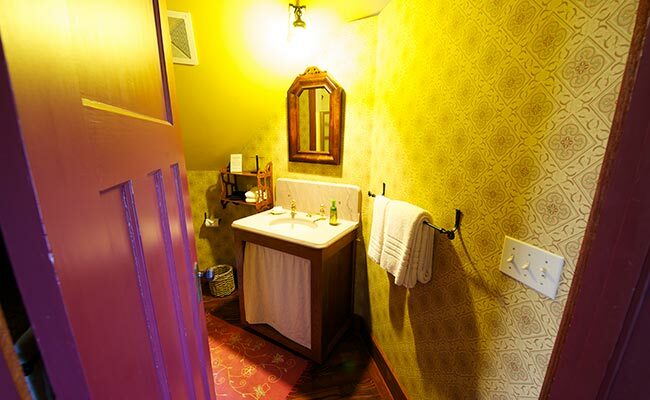 Gas fireplace and large double whirlpool, private bath with shower, King size bed, Wireless High Speed Internet Access, Cable TV/DVD and Ipod dock/alarm clock radio with connection for MP3 player, refrigerator, microwave, central air, and a homemade continental breakfast delivered to your room. Sales tax NOT included. Rates are for double occupancy, per night and include a delicious continental breakfast featuring homemade baked goods and fresh fruit, brought to your room between 7:30 and 10:00 AM. Always check our Packages page for specials. Please visit our Policies page for more information.